Smt. Lalita Mathur is an accomplished Hindustani Classical Vocalist from the Mewati Gharana. 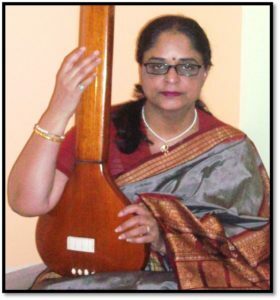 She is senior disciple of Pandita Tripti Mukherjee at the Pandit Jasraj Institute in Edison, NJ, under whom she has been training for over a decade. Having a rich voice and an excellent hold of rhythm, sets Smt. Mathur apart from her contemporaries. Smt. Mathur is a very senior and popular AadyaGuru at the Pandit Jasraj Institute. She has been awarded as ‘Aadya Shree’ by the Institute. Smt. Mathur holds a Masters Degree in Music from Kanpur University and a Alankar Degree from the Gandharv Maha Vidhalya school of Music . Not only have her performances given her esteemed recognition from people that she knows, but she has been given some very distinct awards such as an award from the Uttarpradesh Sangeet Natak Academy. In addition to this very special award she has performed for events such as the United Nations World Summit and has been broadcasted on Danish Radio & Television several times.